Aircraft Ultimate Loads | Stress Ebook LLC. We already briefly covered Limit and Ultimate Loads in a previous FAA regulation blog post. In this post, I would like to expand on that discussion and cover my thoughts on various aircraft ultimate loads, especially limit and ultimate loads on transport category airplanes as well as engine nacelles in general. Military fighter/trainer and rotor craft are outside the scope of this discussion so we will mainly focus on passenger transport category aircraft, and specifically from a structures stand point. It is fair to say that before any design and sizing efforts are conducted on new or modified aircraft designs, it is critical to determine the entire loads envelope that the aircraft will be subjected to during its service life, the highest being aircraft ultimate loads. Let me get into some of these load cases in this post. As a clarification first, could I be oversimplifying these load cases? Probably, but I believe I am not far from the general methodology for developing a majority of these load cases, used in part sizing and stress analysis. 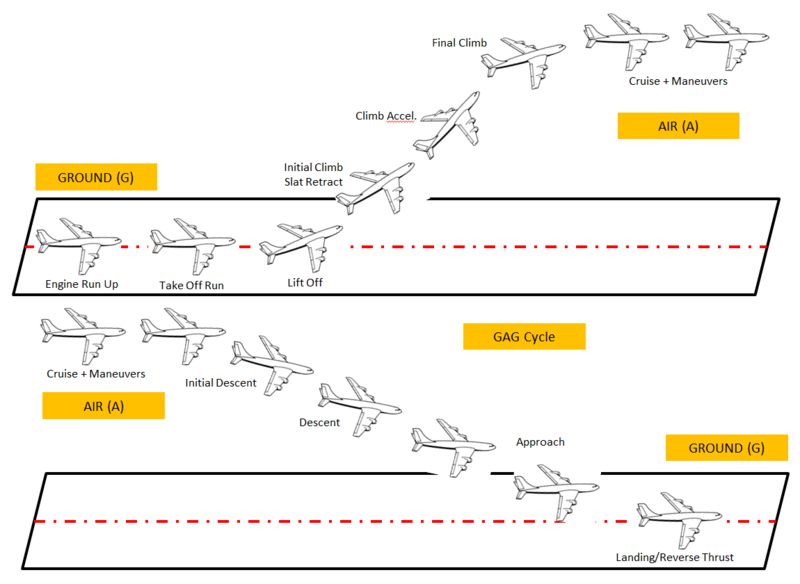 In the figure above, each stage of the aircraft shows a specific flight phase, the top portion is take off and bottom portion is landing. This entire cycle is called the “Ground-Air-Ground” (GAG) cycle. During the entire GAG cycle, various forces act on the aircraft. The major ones being Lift (under the wings), weight (always acting down at the CG), DRAG (acting AFT), Thrust (acting FWD), and of course we have the rear elevator (tail) DOWN load balancing the moment. Thrust helps counteract this moment to an extent due to their under wing location. All of these forces must be in balance at any given point in flight for the aircraft to be stable in the air. Want 2 Free Silver Level Videos? During the standard GAG cycle, there will be various types of maneuvers both in normal air, as well as turbulent air (gusts). Maneuvers include pitching, yawing, rolling and various control surface movement combinations needed to accomplish the flight mission profile. An aircraft must be design for all of these expected limit maneuver loads and resulting aircraft ultimate loads (including SF = 1.5). One of the most important diagrams for the flight mission profile, which defines aircraft limit loads and aircraft ultimate loads, is the Flight Envelope (V-n) diagram. Pilots are usually trained, and required to stay within this flight envelope even if it is possible to exceed this envelope. They are warned that any exceedances could result in loss of control, stability, flutter, or create potential damage to the structure of the aircraft. Each particular aircraft type has its own flight envelope, expressed in terms of the “V-n” diagram. The load factor is basically the ratio of the lift to the weight of the aircraft = L/W and it is expressed as a factor of acceleration due to gravity ‘g’. The aircraft must be designed to fly and land safely for every point within the flight envelope. No detrimental permanent deformation is allowed within the limit envelope, and no catastrophic structural failure that inhibits safe flight and landing is allowed (yielding and damage is allowed) within the aircraft limit to aircraft ultimate loads envelope. We can see in the figure above the two left side curves, these are the "stall" curves. These curves represent the Air Speed and corresponding Load Factor with increasing angle of attack to produce lift. The load factor is limited by what is called the Coefficient of Lift (Cl). The load factors are increasing exponentially as the angle of attach increases to increase lift. Part of the reason for this is that the weight of the fuel and the weight of aircraft are not available to counter the lift force as the angle of attack increases. This limits both the lift and the speed due to structural considerations. Airspeed “V” is plotted along the horizontal axis of the “V-n” diagram and the Load Factor "n" is plotted along the vertical axis. Flight points in the areas to the left of these stall curves will obviously result in the stall of the aircraft. As we all know when the aircraft stalls, it results in loss of control over the aircraft, unless the pilot manages to recover, speed up under the right angle of attack and regain control and lift thus bringing the aircraft back into the Flight Envelope, PHEW! These two inner horizontal lines represent the maximum and minimum (limit) load factors for level or cruise flight that can be achieved without structural damage or yielding under both normal and inverted flights. The aircraft is not expected to see load factors greater than these under normal operating conditions. However, the aircraft must still be designed to fly and land safely without detrimental structural failure beyond these lines. This happens under abnormal and unexpected conditions, under aircraft ultimate loads, but structural yielding and/or damage is allowed as long as it does not impede safe flight and landing. So the two outer top and bottom dashed horizontal lines represent the maximum ultimate load factors on the aircraft. The diagram indicates to the pilots that flight points beyond these lines will result in structural failure. Along the X axis, we can see various markers of air speeds. For a detailed list of what these are you can refer to this regulation: 14 CFR Part 25.335. Various speed markers in the link above describe the stall, maneuver, cruise and dive speeds. 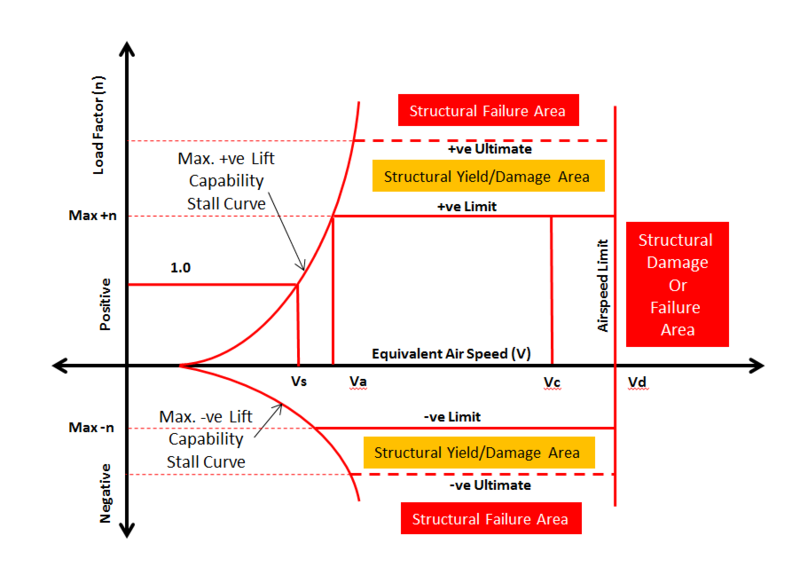 Given the V-n diagram flight envelope above, there will be various gust (statistically known and also unexpected) conditions resulting in sudden yaw, roll, or pitching maneuvers to keep the aircraft stable, in addition to ultimate loads due to normal limit loads * 1.5. All of the above combined will result in literally hundreds of thousands of load cases that a particular transport category aircraft must be certified for. In simple terms, as a starting point, all load cases are defined as limit cases (expected flight envelope cases). Then, a typical safety factor of 1.5 is applied to these limit load cases to determine the aircraft ultimate loads. Then there would be other ultimate emergency landing cases on land and water, or belly landing cases with the wheels up, cabin pressurization (limit, ultimate and fatigue cases). In addition to these cases, there will be many other cases with a limit load case combined with a particular component failure (or two maybe). These are generally treated as ultimate loads with a safety factor of 1.0. Aircraft component failures may include a large component such as an engine or an aileron, or it could be on a sub assembly level component such as a rib or a spar within a major component such as a wing. For example, consider a standard maneuver limit case with certain aerodynamic pressure distribution on the aircraft, it may be combined with the failure of an aileron in flight. This could be an example of a “fail-safe” ultimate case that is derived from a limit case. Except the factor of safety in such a situation is typically 1.0 to avoid an overly conservative and overweight design. A very similar approach is used for engine nacelles. The engine or aircraft manufacturer requires the nacelle manufacturer to use a set of standard limit, fatigue, thermal, residual fatigue (fatigue with a component failure), and reverse thrust load cases. In addition, there would be various other ground operations, system failure and other load cases. Just like the aircraft loads, ultimate loads use 1.5 safety factor on all limit cases and thus creating more load cases. Similar to the aircraft load cases, limit cases combined with component failures are also ultimate cases with various safety factors depending on the load case. All of these load cases have various boundary conditions, aerodynamic pressure load distributions, component failures, system failures, and temperatures that determine the loads along the entire load path. So as you can see, loads are critical, without accurate loads, stress analysis and sizing is basically meaningless. The groups that are primarily responsible for generating loads are the aero elasticity folks, whose input drives the loads group. The loads group ultimately generates all the loads. Both of these groups are generally smaller compared to the stress analysis group, but equally important groups, if not more. Then the stress guys take use the loads from the Loads Group and carry out detailed sizing analysis of the structure, to determine the gauges required to sustain these loads with the ultimate objective of zero margins (minimum weight). Typically, in the beginning of any program, loads are higher due to various unknowns. But as the program matures and progresses towards certification and production, the loads get refined and in most cases go down. In some cases, they may go up, but the objective is always to reduce the weight and refine the loads. The weight of the aircraft or engine nacelle final design that will eventually go into production and enter service with the customer must be as low as possible. I am sure I may be missing a lot of details in this post about aircraft ultimate loads, but I hope this gives you a nice general idea. Surya Batchu is the founder of Stress Ebook LLC. A senior stress engineer specializing in aerospace stress analysis and finite element analysis, Surya has close to a decade and a half of real world industry experience. He shares his expertise with you on this blog and the website via paid courses, so you can benefit from it and get ahead in your own career. Copyright © 2014-Current: Stress Ebook LLC. - All Rights Reserved.